These Peppermint Brownies are so rich & fudgy, flavored with pure peppermint extract, and topped with luscious dark chocolate ganache. The paleo & vegan brownies are full of dark chocolate chips and cacao nibs. Big thanks to Sunfood for sponsoring this post! 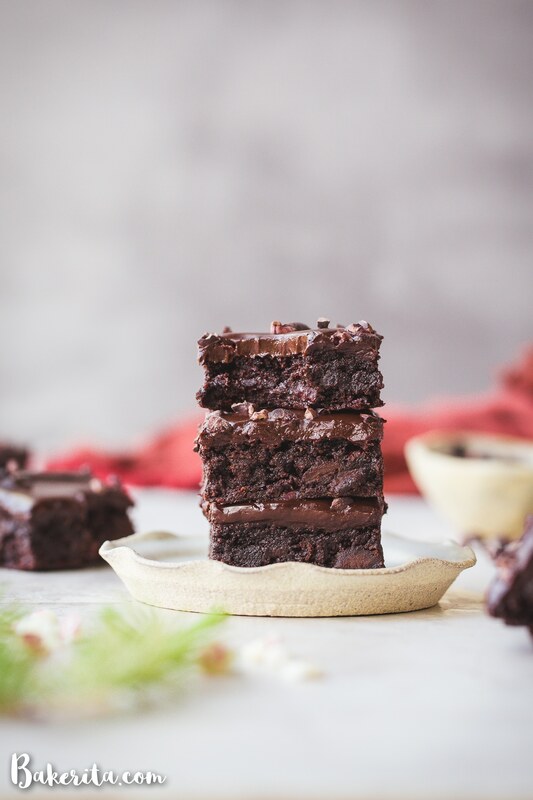 Lately, as we’ve been getting into the full swing of the holiday season, I’ve been seeing this older recipe for Peppermint Brownies blowing up and getting so many views. And well, I wanted them. But since they pre-date my days of eating and baking gluten-free, dairy-free, and refined sugar-free, the recipe wasn’t exactly conducive to my current diet. I figured a lot of you are probably into the idea of peppermint brownies too, but a new gluten-free, paleo, and vegan version, so I decided to make my vision come to life. Just as rich, fudgy, and minty as the OG peppermint brownies, but overhauled with my favorite healthier ingredients. 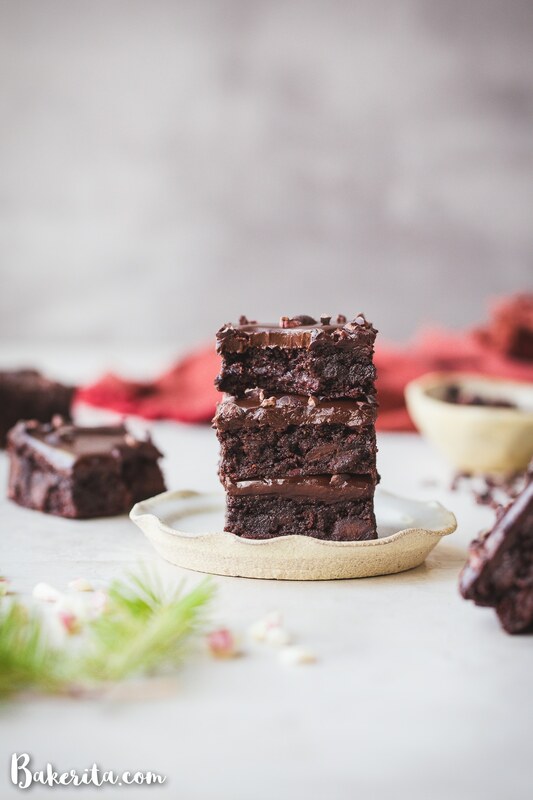 These use ingredients like unsweetened chocolate, coconut oil, almond butter, and coconut sugar to recreate the fudgy goodness of the originals while staying paleo & vegan. In addition to the unsweetened chocolate, I used Sunfood’s cacao powder & cacao nibs to keep them super rich and chocolatey. Sunfood’s products are always organic and raw and of the highest quality, which translates into baked goods with the best taste & quality too. For that minty flavor, I use pure peppermint extract, which is different than pure peppermint oil, which is a lot stronger and not always food-safe. If you have a food-safe peppermint oil that you’d prefer to use, I’d recommend starting off with just a few drops, tasting, and adjusting from there. 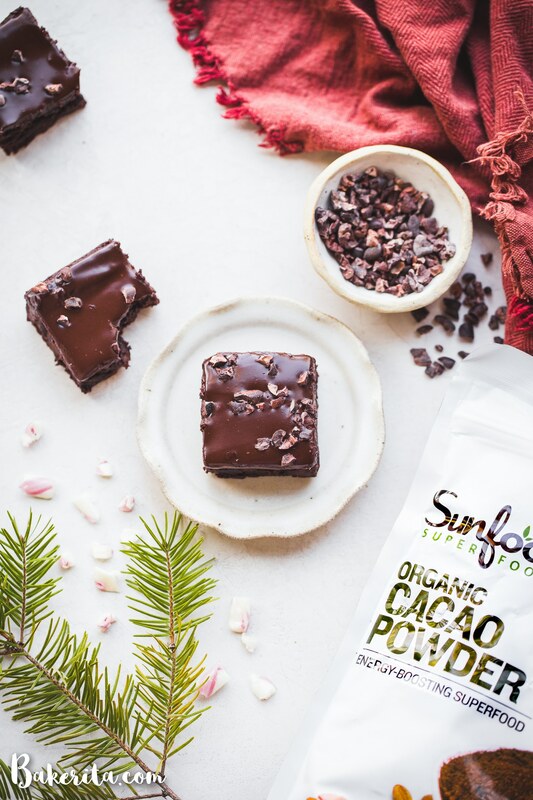 For extra chocolatey richness, dark chocolate chips and Sunfood cacao nibs are mixed into the brownie batter. The chips add melty chunks and the cacao nibs add a bit of chocolate crunch. 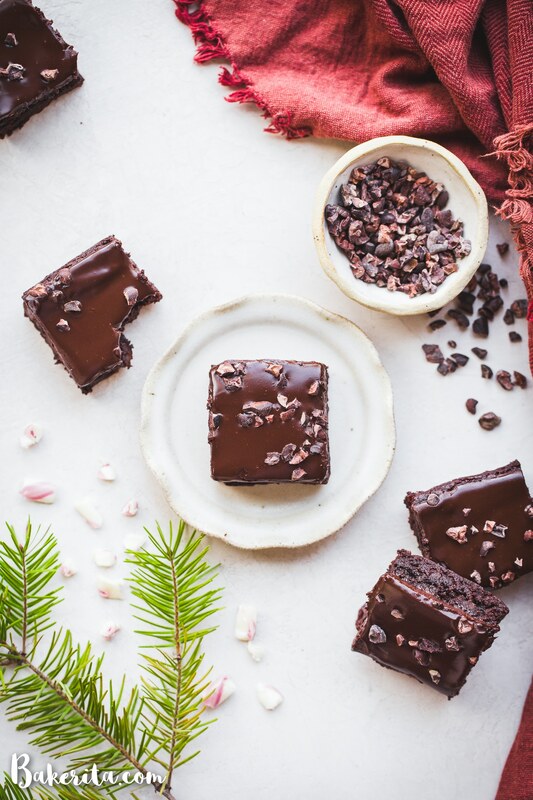 A luscious vegan chocolate ganache tops it all off, which is then adorned with more cacao nibs and if you’d like to be extra festive, some crushed candy canes. After a quick stint in the fridge, these Peppermint Brownies are fudgy and begging to be devoured. One bite and you’ll be in fudgy brownie heaven. Hints of peppermint, crunchy cacao nibs, and TONS of dark chocolate flavor – what more could you want? These are fudgy to the max and are SURE to satisfy your chocolate cravings. Enjoy!! 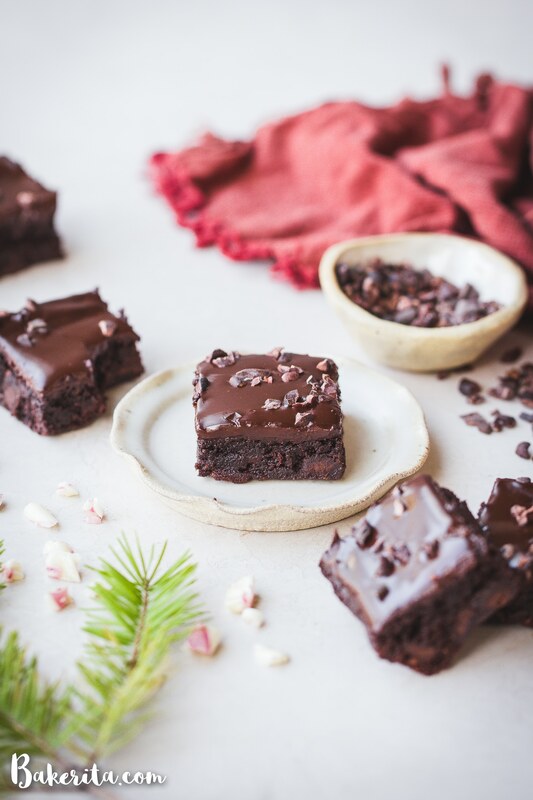 These Peppermint Brownies are rich & fudgy with luscious dark chocolate ganache on top. The paleo & vegan brownies are flavored with pure peppermint extract and full of dark chocolate chips and cacao nibs. Preheat oven to 350°F. Line with parchment and lightly grease an 8x8” baking pan. Put the unsweetened and coconut oil in a large glass bowl and microwave for 30 seconds. Stir, and repeat until the chocolate and coconut oil are completely melted and smooth. Add the maple syrup, coconut sugar, and almond butter. Whisk until completely combined. Add flax egg, peppermint extract, and vanilla extract to the chocolate mixture and whisk until combined. Add the almond flour, cacao powder, salt, and baking soda to the chocolate mixture and once it’s stirred in, fold in the chocolate chunks and cacao nibs. Bake in the preheated oven for 20 to 22 minutes, or until a few crumbs are attached when a toothpick is inserted into the center, but it’s not too wet. Place on a wire rack to let it cool completely. Place the chocolate chips or chopped chocolate in a small bowl. Heat the coconut milk for 20 to 30 seconds until the microwave until bubbling. Pour over the dark chocolate and let sit for 1 minute before stirring until smooth. Spread evenly over the cooled brownies and sprinkle with crushed candy canes and cacao nibs. Store in an airtight container at room temperature for a few days, or in the fridge for up to a week. Can you use real eggs instead of flax eggs? The recipe hasn’t been tested that way so no guarantees, but it should be fine – I’d use one full egg and one egg yolk! Could regular flour be substituted for the almond flour? I would also be substituting a seed butter instead of the nut butter (nut allergy…and dairy, and soy). Would love your thoughts. The recipe looks delicious! !